The recently renovated 2-star Sylvia Hotel Rhodes has a great location close to the marina in historic Rhodes Town. Its 42 guest rooms are comfortable and cosy with the majority of them having stunning views towards the Medieval Old Town. There's the option of single, twin, double and triple rooms and all the rooms have a TV, air-conditioning and a balcony to make the most of the Greek sunshine and those views.A family run hotel, the Sylvia Hotel Rhodes serves buffet breakfast daily and offers guests a traditional homemade Greek breakfast of pies. There is a bar where guests can enjoy drinks in the evening after a long day sightseeing and there's also the option of ordering room service. Guests can watch satellite TV in the lounge area of the lobby or in the comfort of their own room. For guests wishing to hire a car to explore more of the island then there is free parking available at the hotel. Guests can also find information in the lobby and reception about excursions and cruises that depart from Rhodes Town. With a choice of rooms sleeping from one to three guests, the Sylvia Hotel Rhodes is the perfect choice for single travellers, couples and families. The hotel's central location close to the Old Town means it's ideally placed for guests to see all the sights Rhodes Town has to offer, plus it is close to beaches, Mandraki Harbour, restaurants and tavernas. Spread over four floors, the hotel has 42 rooms. There's the choice of single, twin, double or triple rooms, all of which have views of Rhodes Town. All the rooms have a balcony, en-suite bathroom, air-conditioning, TV, fridge and a telephone. Certain amenities may be payable locally. The hotel has a breakfast area where buffet breakfast is served daily. There's also a hotel bar and room service available. 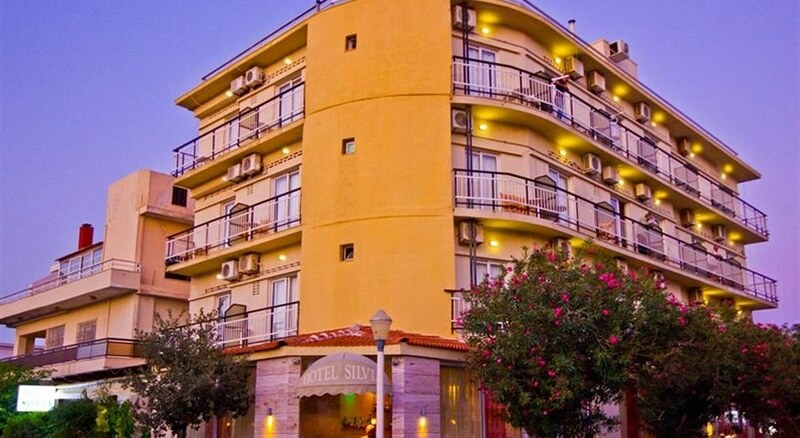 The Sylvia Hotel Rhodes is located in Rhodes Town and has views to the Medieval Old Town and is a short walk away from the marina and Zefyros Beach. Rhodes Town is famous for its Medieval walled city, which is a UNESCO World Heritage Site with fascinating places to visit including the 14th century Palace of the Grand Masters.